The greens are good for a course at this price level. By some distance the best feature of this course. Quite large, with challenging – but not extreme – slopes, all nicely mowed to consistent short level. Well-watered with spongy feel, but still medium-fast and run true. The course itself is quite flat, at most gently undulating. Fairways are wide and there is virtually no real rough. If you miss a fairway, you typically end up in some mature trees (mostly gum trees) that line fairways. From there you can invariably get some kind of recovery shot. Some fairways slope gently right-to-left or vice versa, and some holes are also gentle dog-legs. So if you get an adverse slope on a dogleg, you have to hug the 'top' side of the fairway. All this is clearly visible as you go around the course and there are also high quality printed plastic hole maps on each tee. Most holes have three or four bunkers, with virtually every green having two bunkers somewhere close by. But these bunkers are not particularly deep, and have decent fine sand. So they are not particularly difficult. Overall, Atalaya Old is quite a gentle course. 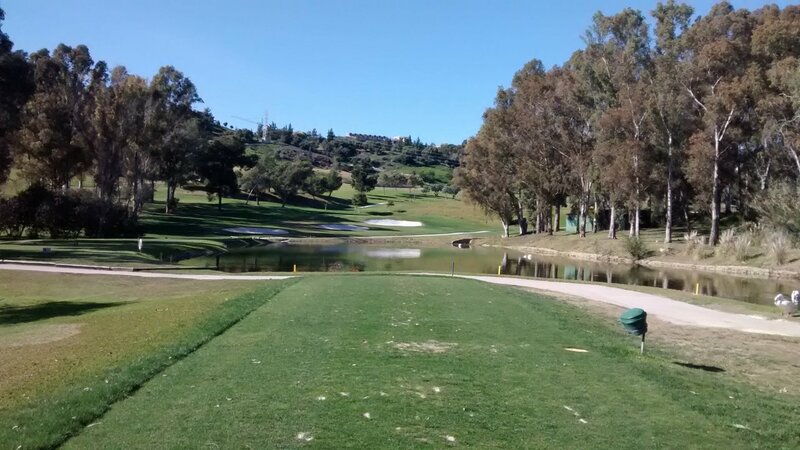 Sensible play means you can avoid most hazards and the generally flat nature of the course means that there is no real difficulty in figuring out distances you need to hit the ball. To add some difficulty back in, they have elevated all the greens by a meter or more. This I think is good. It increases the difficulty of the course from 'really quite easy'. So are there are negative aspects to Atalaya Old ?. I can think of only one – the fairways are not particularly high-quality. Several types of grass growing, tightly mowed and still perfectly acceptable. But simply not up to the same consistent quality as more upmarket golf courses. The first-cut rough just off the fairway is also well mowed, but mixed grasses growing there also introduce some randomness. The tee-boxes are also a bit scruffy, but then I do not care much about things like that. In short, the fairways up to the greens are of a lower standard than the greens themselves. Which is as it should be. If a club has to make choices, the first priority should always be the greens. I certainly recommend Atalaya Old to quite high-handicap players. It really is not very tough at all. Wide fairways, little true rough and good greens – all on quite a simple and open course – mean that even a high-handicap player can post some kind of score on every hole here. Mid-handicap players like me should find this course quite easy. Most hazards can be avoided quite easily, the course is not particularly long, and dog-logs are fairly predictable. Low-handicap players who have played the course a few times should play comfortably within their handicap if their putting on the day is OK.
For me personally, not a favourite course. A little bit too sedate. A pleasant-enough parkland-type course, but not particularly beautiful. Not a course I really respect or admire. But still a good course for average players – and priced accordingly. Review last updated: July 2015. Number of times played: 3. Atalaya Old is represented by the brown dot and Atalaya New is represented by the yellow dot. 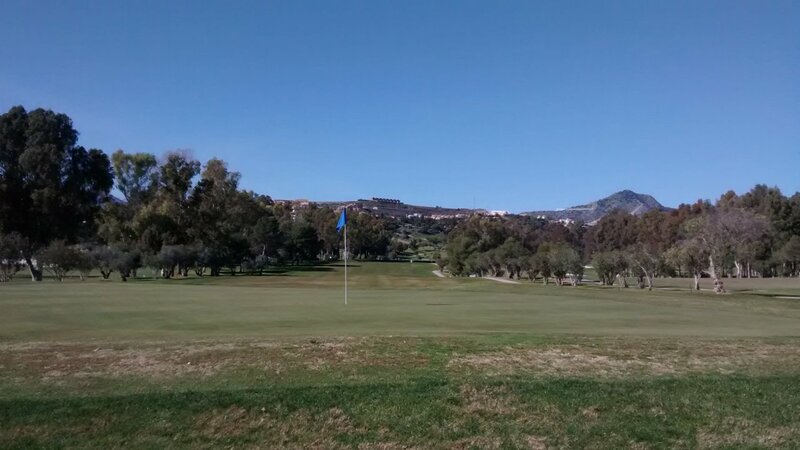 Atalaya Old is a mid-ranked course in terms of difficulty compared to other courses on the Costa del Sol and is slightly longer than the average course down here. 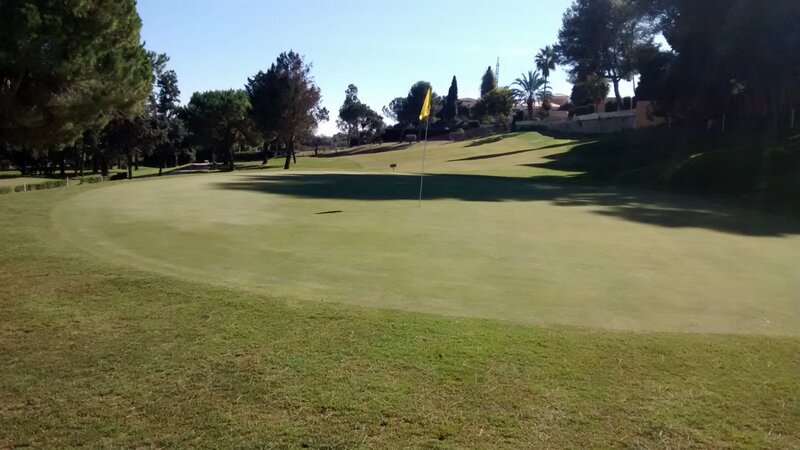 An 18-handicap player can expect to go around Atalaya Old in 20 over par.